“The Sky Over Nine Columns”. Sankt Moritz, December 10th 2016. Ralph Donnermuth is a welthy man, a maecenas and an art collector. When he found himself facing Heinz Mack’s artwork The Sky Over Nine Columns, placed in front of Palladio’s San Giorgio Maggiore Basilica, within the 14th Venice Biennale d’Architettura 2014, he determined that an exhibit of that effect should be seen by the largest possible audience. On the other end, Heinz Mack, the author of the artwork, is convinced that Art should be within the reach of everyone and should not be confined to the dusty atmosphere of museum halls. From the encounter of these two gentlemen, eased by the good offices of Beck & Eggeling, international fine art gallery in Dusseldorf, The Sky Over Nine Columns has become the first art installation to travel permanently around the globe. Herr Dommermuth has acquired two identical specimen of the work. After installing one in his art garden, he has established the Ralph Dommermuth Art and Culture Foundation, entitled to make the second travel around the globe. 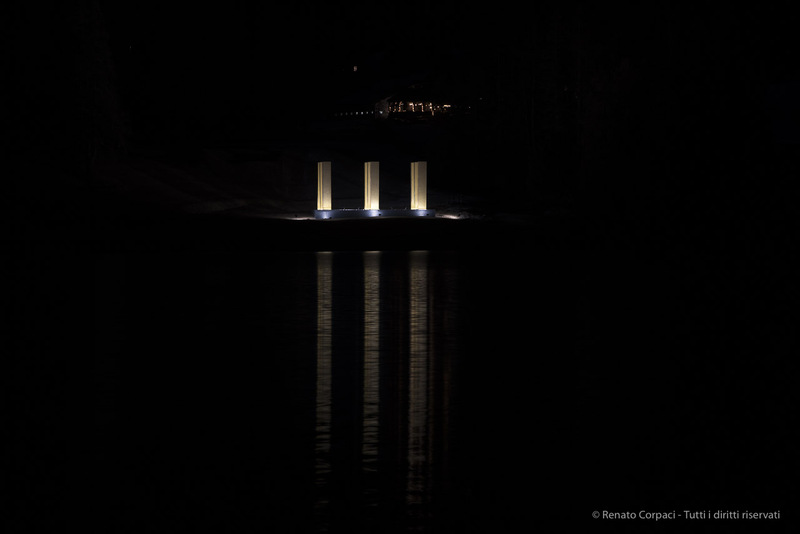 After Venice, Istanbul and Valencia, Mack’s Nine Columns have landed on the lake bank in Sankt Moritz, where the slanting rays of the winter sun hit the golden tesserae, returning the light in thousand different directions. The work consists of nine pillars, seven meters high, coated with 850,000 golden tesserae, covering an area of 261 m2 , and weights 53.3 tons. Heinz Mack, 85, has spent the last 60 years working as a painter and a sculptor. He is co-founder, in 1958 of the ZERO group, together wit Günther Uecker, Yves Klein, Lucio Fontana and Piero Manzoni. The artist is presently considered to be one of the major representative of Kinetic Art. He lives and works between Mönchengladbach and Ibiza. The monument has been unveiled Saturday December 11th, in front of a large public of friends and onlookers, introduced by a musical performance, The Sky Over Nine Trumpets by composer Bernd Franke. It will stand in Engadina up to march 15th 2017. Then it will take the road again to an undisclosed destination.